It is with pleasure that we welcome our AoM for October, Michael Jaye PhD., whose book, The Worldwide Flood, reveals evidence of the flood catastrophe in deep antiquity. Central to Jaye’s effort is his uncovering of mainstream Geology’s pivotal ‘no flood, ever’ error, whose roots lie in the early decades of the nineteenth century. Descriptions of a killer global flood that inundated inhabited lands of the world turn up everywhere amongst myths of antiquity. In many cases these myths clearly hint that the deluge swept away an advanced civilization that had somehow angered the gods, sparing ‘none but the unlettered and the uncultured’ and obliging the survivors to ‘begin again like children in complete ignorance of what happened … in early times’. Such stories turn up in Vedic India, in the pre-Columbian Americas, in ancient Egypt. They were told by the Sumerians, the Babylonians, the Greeks, the Arabs and the Jews. They were repeated in China and southeast Asia, in prehistoric northern Europe and across the Pacific. Almost universally, where truly ancient traditions have been preserved, even amongst mountain peoples and desert nomads, vivid descriptions have been passed down of global floods in which the majority of mankind perished. that legends of a great flood in which almost all men perished are widely diffused over the world…. Stories of such tremendous cataclysms are almost certainly fabulous; [but] it is possible and indeed probable that under a mythical husk many of them may hide a kernel of truth; that is, they may contain reminiscences of inundations which really overtook particular districts, but which in passing through the medium of popular tradition have been magnified into worldwide catastrophes. recollections – vastly distorted and exaggerated … of real local disasters…. There is not one deluge legend but rather a collection of traditions which are so diverse that they can be explained neither by one general catastrophe alone, nor by the dissemination of one local tradition alone … Flood traditions are nearly universal… mainly because floods in the plural are the most nearly universal of all geologic catastrophes…. Graham’s guess was prescient and close to correct, for new evidence shows that a single, recent (in a geologic sense) cataclysm, the worldwide flood, forever changed the planet. More on the flood and its supporting evidence in a moment. For now, however, please notice how the belief that there was never a worldwide flood permeates Graham’s passage. Rather than treating the flood stories as valid, eye-witness accounts, the stories are instead ascribed as myths or vastly distorted, fantastic accounts of local events. Furthermore, Graham notes that anyone thinking there might have been a flood is considered unserious, a rube, and certainly not an academic. His short passage demonstrates the pervasiveness of geology’s ‘no flood, ever’ tenet, now nearly 200 years old, that has all of us believing that there was never a worldwide flood. ‘No flood’ is an integral part of science, and it affects all that we believe and think that we know. Perhaps paradoxically, as a ‘no flood, ever’ consequence, we must believe that ancients from around the planet paddled their canoes thousands of miles to some centralised myth-making conference, where they conjured the fabulous flood story to confuse the thinking of future generations; and that after attaining consensus on the story, they paddled their canoes back to their homelands and, upon return, convinced their kinsfolk to accept and propagate the story for hundreds of generations. Which is the more absurd, that the conference was a success or that there was a flood? Put another way: ought not the many worldwide flood accounts have us questioning geologists and their fundamental belief? Could there exist an error in the science? I am now going to give away portions of my book, but I do not care. Getting out the message that geology messed up 200 years ago is critical, especially because of its import to human pre-history, anthropology, geology, and, more proximately, to Graham’s and his readers’ interests. Figure 1. Monterey Canyon and the Big Sur drainages off the coast of Central California. The combined river system ends in the lower left, approximately 250 km from its origin near what is now known as Moss Landing, California. When I first saw the submerged features off the coast my reaction was: how did that drainage system become submerged in so much water (more than three kilometers, or two miles)? I have studied fluid dynamics, so I know that concentrated subsurface flows could not persist over the distances involved to carve the structures, particularly so because some of the structures coursed through abyssal plains where there could not exist sufficient gravitational potentials to create forceful, focused, subsurface flows. I was perplexed, and I wondered: what known process and what associated source of energy would cause subsurface flows to focus, especially over the distances involved? How could there exist meanders and oxbows when any gravitational flow would travel straight and down-gradient? Are we to accept that submerged flows behave exactly as subaerial flows? If not, then how could these structures have formed subsurface? What gives? The vast masses of diluvial gravel … do not belong to one violent and transitory period. It was indeed a most unwarranted conclusion when we assumed the contemporaneity of all the superficial gravel on the earth…. Having been myself a believer [in a worldwide flood], and, to the best of my power, a propagator of what I now regard as a philosophic heresy, … I think it right … thus publicly to read my recantation. It was a celebrated event, and to this day it remains exulted as the triumph of science over religion (a misnomer, as it more correctly should have been labeled the triumph of science over the human narrative tradition). It is because of Sedgwick that, to this day, all of science holds that there was never a flood. Interestingly, today’s lettered geologists staffing the science’s premier journals do not know the source of the fundamental ‘no flood, ever’ tenet, described above. They simply accept ‘no flood’ as an article of their faith, and, as Graham alludes to above, they immediately discount anyone thinking otherwise. I know this because I have dealt with them. Many of them. I have found that the very few aware of the history are wholly uncritical of the conclusion relative to its supporting evidence. Uncritical? Indeed. It turns out that the celebrated, pervasive ‘no flood, ever’ finding is the source of our collective amnesia and all cognitive dissonances regarding our past, for the early geologists’ conclusion is indisputably wrong. From the evidence, they should have concluded that where we are now was never flooded, something that is undeniably true yet wholly different from the tenet holding that there was never a worldwide flood. That is, the early geologists should have concluded that presently exposed landscapes were never subjected to a common flood event. That is undeniably true. However, and unfortunately for us and for all of modern science, the early geologists passed judgment on vast, submerged landscapes that they could not observe; they assumed that all of Earth’s waters have been with us since the beginning. It was an historic blunder. We could not see into the bathymetry to observe submerged landscapes until recently. 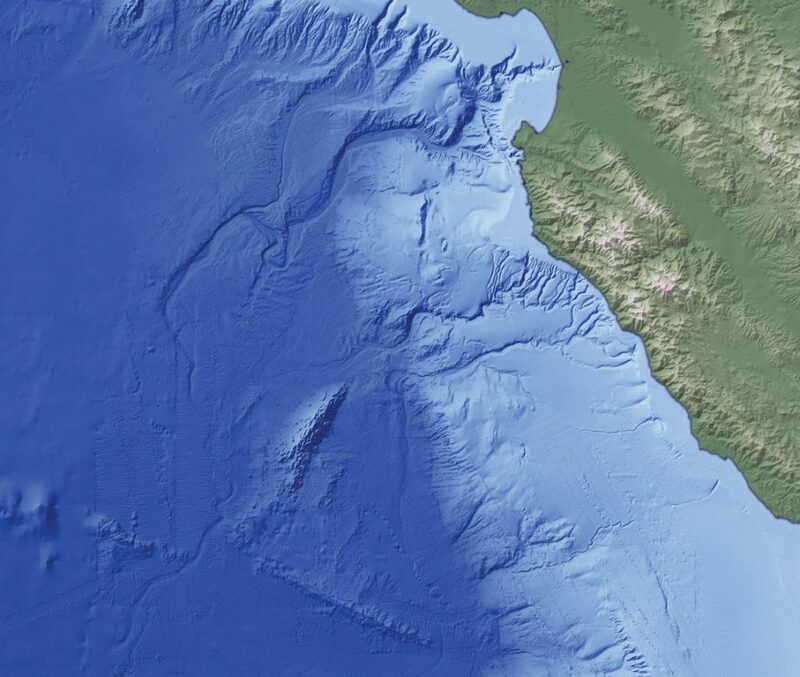 Today, however, the new maps allow us to observe the topography of ocean floors where we find former rivers. The new maps unequivocally reveal well-preserved drainages under more than two miles of water, and they are ubiquitous. Their existence implies that there must have been a worldwide flood. Please note that we are applying the scientific method: new data (maps) caused us to review theory. And what we find immediately is that geology’s ‘no flood, ever’ paradigm is erroneous. The new data should evoke new thinking, which in our case would result in the restoration of the belief that the Earth suffered a devastating flood. That geologists have failed to review their fundamental belief in the presence of this new data is yet another powerful testament to the constraining effect that ‘no flood, ever’ holds over science, related disciplines, and rational thought. 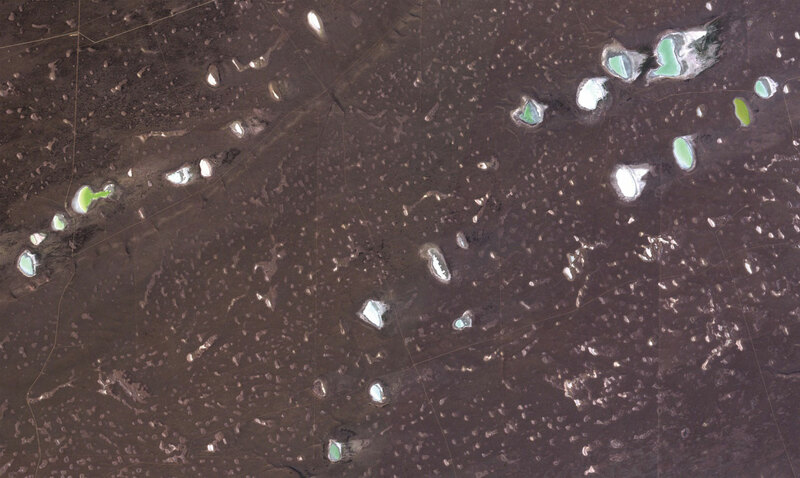 Interestingly, but as yet unrecognized by geologists, thousands of similar impact craters are found along the entire length of South America – we can identify them on Google Earth. Some are shown on Figure 2; a list of example craters found in North America and South America is provided in Appendix B of my book. Figure 2. Several hundred IO fragment-created craters of various sizes are shown in this map. The long axes of the larger craters measure approximately one kilometer whereas the smaller craters are one-tenth that size. I knew to look for ice chunk-created impact craters in South America because I had located the flood-inducing impact site in the Southern Ocean. It is shown on Figure 3. Note what appear to be parallel central scrapes. They are the sides of a lengthy trough that was carved by the solid, central nucleus of the impacting object (IO) immediately after it hit. This trough indicates the direction of travel taken by the IO, and back-propagating its direction indicates to us that the object overflew North America and South America immediately prior to impact. Along the way, its ice fragments rained down and created the many craters that we can find on the new maps. Figure 3. The IO impact crescent is found in the Southern Ocean. The parallel central scrapes delineate the trough carved by its solid nucleus that served as the gravitational attractor in the Oort Cloud where the IO formed. Minerals and other debris delivered by the IO are found in deposit mounds interior to the crescent. The gap in the crescent was caused by IO fragmentation on its Earth approach; impact velocities and associated forces strew minerals and other debris nearly 1000 miles to the northeast through the gap. Among its many names, the IO is known in various cultures as Phaeton, Set, and Satan, and it was one of a class of objects from which smaller comets are but fragments. It was loosely packed (as are its fragments that we call comets) due to small gravitational accelerations induced by its dense nucleus, as the object formed in the Oort Cloud, far from gravitational effects from our Sun and other stars. The IO impact crescent measures roughly 2500 km (~1500 miles) in diameter, and the width of its central trough measures somewhat less than 100 km (~60 miles) in diameter. The IO’s loosely packed nature likens its Earth-impact to a huge, porous ice-ball with a rock in the middle hitting a brick wall. We know about comet composition from NASA’s Deep Impact mission (A’Hearn et al. 2005, Wilson 2005), so we can estimate the volume of water delivered by the IO’s melted ice. From the IO’s radius, we can calculate the volume of water it contained, and once we have that number we divide it by the surface area of the oceans. This calculation yields an average depth, which in this case comes out to be a bit more than two miles. (Jaye 2017.) This is a nearly incomprehensible amount of water, and its addition to the Earth ecosystem forever changed the planet. The IO’s waters flooded the planet, and they did so from the abyss upward – they did not inundate presently exposed landscapes. In addition, the IO’s impact created the recently discovered nano-diamond layer (Kinzie et al. 2014), and its ecological influences are known as the Younger-Dryas effects. The IO’s waters ushered in a new geologic era that I call the Post-Diluvian. The waters nearly killed our species. It is interesting to consider pre-flood Earth, a model for which is shown on Figure 4. It was created in ArcGIS by removing an estimated average depth of two miles from the present sea level. Humans evolved in the dark tan regions; we are not out of Africa. Human civilizations such as Zealandia, Lemuria (Mu) and Atlantis were destroyed by the flood waters. The canals of Atlantis are observable in NOAA maps (Jaye 2017), and I am confident that they will be investigated one day–hopefully soon. Figure 4. 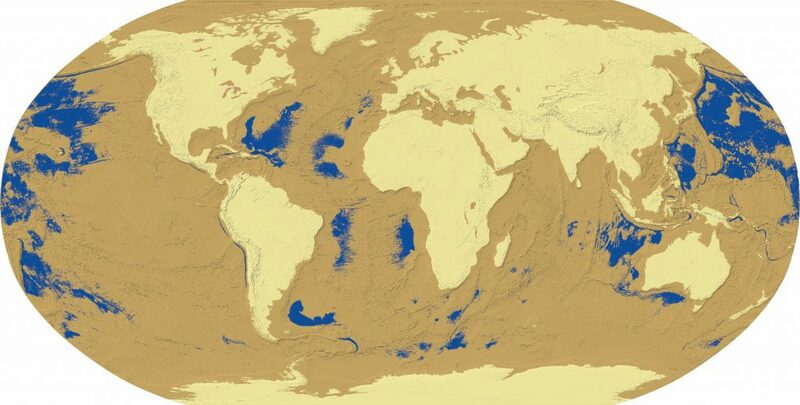 With more than 3 km of water graphically removed, a model of land and sea distributions in pre-flood Earth shows previously exposed but now-submerged landscapes (tan), presently exposed landscapes (beige), and former oceans and seas (blue). With the removal of so much water, the atmosphere would have covered the former abyss. Thus, the dark tan areas on Fig. 4 experienced increased atmospheric pressure which would have led to higher temperatures. We are furless as a consequence. Who knows what it was like down there, but it is nearly certain that we did not struggle for food – we were adapted to that ecosystem. I do not mention this in my book, but it is very possible that the variety in human skin pigmentation is due to the depth above the former abyss at which various peoples adapted. Those from the greatest depths would be of lightest skin pigmentation due to highest atmospheric attenuation of ultraviolet rays; those of darker pigmentation are likely from higher elevations where they adapted to greater UV exposure. Imagine how the IO appeared to the ancients as it neared Earth. At 10,000 times the surface area of Halley’s comet and 1,000,000 times its volume, the IO would have had a fiery appearance and an incredibly lengthy tail. It would have dominated the sky, particularly as it neared impact. Its post-impact effects account for the tradition that comets are harbingers of change. The Chinese New Year dragon, a fiery serpent above the clouds with water emanating from its mouth, is a commemoration of the IO. The story of Adam and Eve is but another flood story: naked humans were evicted from their natural environment by the serpent (imagine my “Aha!” moment when I found that the IO was known as Satan), and having to adapt to a new environment changed their nature; they and their ancestors struggled to survive. Nomadic humans sought habitable regions as the Earth transformed from its pre-flood state to the present ecosystem. We find evidence of pre-flood human activity nearly exclusively in tropical latitudes because, at more than two miles above the former sea level, most of the yellow regions on Fig. 4 (post-flood exposed landscapes) were too cold for human habitation. I’ll leave it to the professionals such as Graham to put all they know about human pre-history into the correct context that there was a worldwide flood, but I am confident that the map on Fig. 4 will help in reconciling narrative traditions and other knowledge. Meantime, let us all recognize that geology’s ‘no flood, ever’ paradigm is an immense mistake: two branches of science, geology and anthropology, are fundamentally incorrect. This renders Google Earth as the historic equivalent to Galileo’s telescope – each ‘device’ revealed data that led to overturning incorrect scientific paradigms. But how do we get geologists to recognize their error? Should we treat them with derision? Do we mock them for adhering to an incorrect tenet as if it were religious dogma? I am not sure, but this much is certain – they must recognize their error. They must be asked: Why do you believe there was never a flood? and Do you not recognize the logical error committed by your predecessors? We must make them reform. Let us all realize that there was a worldwide flood, and let us carry out the task of correcting the most profound error in the history of science. A’Hearn, M.F., M.J.S. Belton, W.A. Delamere, J. Kissel, K.P. Klaasen, L.A. McFadden, K.J. Meech, H.J. Melosh, P.H. Schultz, J.M. Sunshine, P.C. Thomas, J. Veverka, D.K. Yeomans, M.W. Baca, I. Busko, C.J. Crockett, S.M. Collins, M. Desnoyer, C.A. Eberhardy, C.M. Ernst, T.L. Farnham, L. Feaga, O. Groussin, D. Hampton, S.I. Ipatov, J.-Y. Li, D. Lindler, C.M. Lisse, N. Mastrodemos, W.M. Owen Jr., J.E. Richardson, D.D. Wellnitz, and R.L. White. 2005. Deep Impact: Excavating comet Tempel 1. Science (310) 5746: 258–264. Firestone, R.B., A. West, J.P. Kennett, L. Becker, T.E. Bunch, Z.S. Revay, P.H. Schultz, T. Belgya, D.J. Kennett, J.M. Erlandson, O.J. Dickenson, A.C. Goodyear, R.S. Harris, G.A. Howard, J.B. Kloosterman, P.Lechler, P.A. Mayewski, J. Montgomery, R. Poreda, T. Darrah, S.S. Que Hee, A.R. Smith, A. Stich, W.Topping, J.H. Wittke, W.S. Wolbach. 2007. Evidence for an extraterrestrial impact 12,900 years ago that contributed to the megafaunal extinctions of the Younger Dryas cooling. Proceedings of the National Academy of Sciences 104:16016-16021. Hancock, G. 2002. Underworld: The Mysterious Origins of Civilization. New York: Crown Publishers. Jaye, M. 2017. 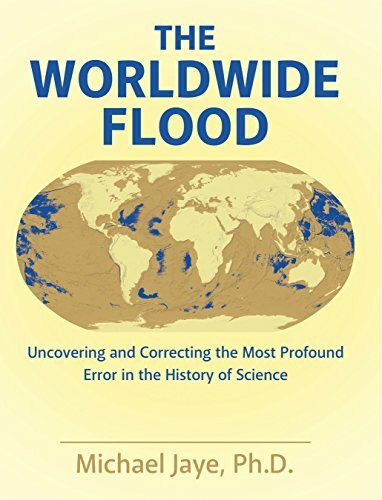 The Worldwide Flood: Uncovering and Correcting the Most Profound Error in the History of Science. Bloomington, IN: Archway Publishing. Kennett J.P., D.J. Kennett, B.J. Culleton, J.E.A. Tortosa, J.L. Bischoff, T.E. Bunch, I.R. Daniel Jr., J.M. Erlandson, D. Ferraro, R.B. Firestone, A.C. Goodyear, I. Israde-Alcántara, J.R. Johnson, J.F. Jordá Pardo, D.R. Kimbel, M.A. LeCompte, N.H. Lopinot, W.C. Mahaney, A.M.T. Moore, C.R. Moore, J.H. Ray, T.W. Stafford Jr., K.B. Tankersley, J.H. Wittke, W.S. Wolbach, and A. West. 2015. Bayesian chronological analyses consistent with synchronous age of 12,835–12,735 Cal B.P. for Younger Dryas boundary on four continents. Proceedings of the National Academy of Sciences of the United States of America 112 (32): E4344–E4353. Sedgwick, A. 1831. Address to the Geological Society of London, on retiring from the President’s Chair, February 18. Vitaliano, D.B. 1976. Legends of the Earth: Their Geologic Origins, 142-78. Indiana University Press. Wilson, E.K. 2005. An Icy Dustball in Outer Space. Chemical & Engineering News 83 (37): 12. Zamora, A. 2017. A model for the geomorphology of the Carolina Bays. Geomorphology 282:209-216. 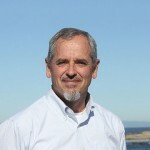 Michael Jaye, Ph.D., recently retired as an associate professor at the Naval Postgraduate School in Monterey, California. Prior to that, he spent fifteen years teaching mathematics and its applications at the United States Military Academy in West Point, New York. His interest in the Worldwide Flood began with Google Maps images of the submerged Monterey Canyon system. He and his wife, Donna, have four adult children and two grandchildren. I’m sure I read an article from yourself on Graham’s website about a year ago relating to the Monterey canyon river system. 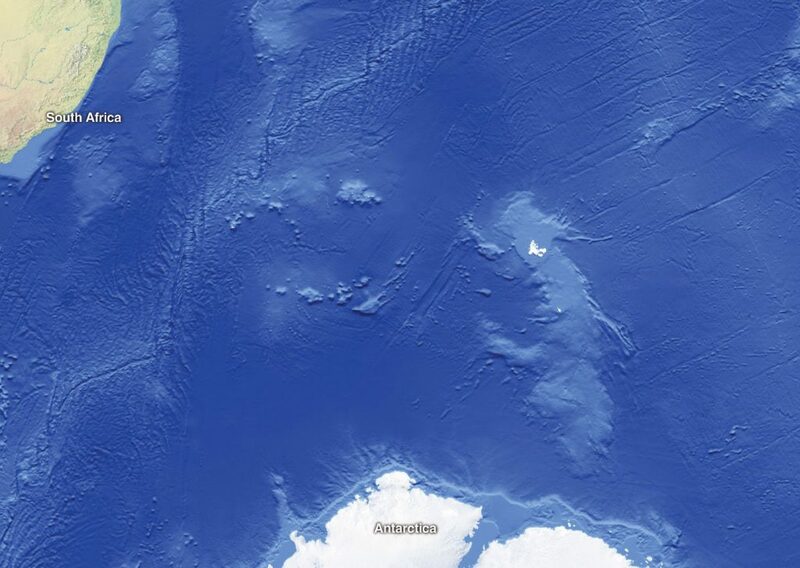 Looking at Google earth I’ve always though that the southern tip of south America and the corresponding region in Antarctica always look like a massive object has smashed through the landscape at a shallow angle, with the land pushed back in wings and a huge trough with a ridge formed along the line of Saunders island etc. Any debris continuing on would be in line with the parallel line scrapes in the Indian ocean. Just a though. Eaddy – your observation is part of another event, tens of millions of years prior to the flood, that also changed the planet. Note that the trough at the southern end of SA has a rightward bend (use google Earth) – very important. Also, take a look at the northern end of SA…. Impacts sites were across the Pacific. Firstly I am not an academic, just a recently interested lay person. I have read prior to Michael’s proposition that a comet striking the Earth in the vicinity of the Bay of Mexico caused the 2 mile ice-sheet covering N America and much of northern Europe to melt rapidly and this cause severe flooding on a global scale. I must say that BOTH scenarios are plausible to me; however which is the correct one? Interestingly the author mentions the visibility of canals on Atlantis BUT fails to say where he believes Atlantis lays. My recent interest has shown that due to earth-crust slippage, Atlantis, was once located some 2000 miles (or is it kms)closer to the equator than its current position as the continent we know as Antarctica. A very, very close look at Fig 4 (above)shows something between S America and the west coast of Africa but also shows the southern continent as well! Puzzling. Great update and it about time the science community gets together on this topic. With all the trouble taken into making these artist renditions and there was no thought to show us what he was talking about! I see none of what he mentions of parallel lines in figure 3. I do believe there was a major flood but why couldn’t it have been localized? He even mentions that he doesn’t think the whole world was under water. Recently we have seen things like Taiwan and their Tsunami incident. Could there have been major earthquakes happening all around the world causing Tsunami’s at the same period over a few years? An earthquake and resulting Tsunami could have wiped out any city and caused a change in landscape. I would imagine most populated cities would have been by the water. I accept there may have been a flood and a IO but the quantities of water you are talking about are ones that would mean we have a completely different ecosystem. We have large migratory sea animals, deep water ones and coral reefs (in the mapped flood zone) which are millions of years old. Adding that much extra water would completely change weather patterns too . It doesn’t seem like there is enough water to create rainforests etc. so I’d be surprised if it could be this much. Yes, this is an entirely new ecosystem, and we are a surviving, map-adapted species. Sorry for the typo, was supposed to have been ‘mal-adapted’. An interesting abstract. The evidence for a planetary cataclysm is, I believe, overwhelming. I wonder if Dr. Jaye has read Allan and Delair’s book, “Cataclysm!”? They, too, date the Great Flood at about twelve-thousand years ago. Charles Hapgood’s work on portolano maps and crustal slippage is suggestive. I think the causative event was extraterrestrial, i.e., external, but not confined to Earth. The devastation of Mars and Venus, as well as other solar-system disruption, happened at the same time. Graham has commented on this at length, in “The Mars Mystery”. I like the term “protohistory” for these investigations; we need to set fire to the current paradigm filter. Allyn & Delair are cited in my book. They were very close to figuring things out. Was hoping that Graham would help to set fire to things. Dr. Jaye’s article is compelling; so much so I bought his book and couldn’t put it down. He presents an intriguing theory supported by geological evidence (continuation of river/steam beds below the current mean sea level). It raises numerous questions for the scientific community. Is there any expedition being planned to search for Atlantis at the coordinates Dr. Jaye gives? The locations of ancient monuments such as the pyramids, sphinx, Gobekli-tepi, Machu Picchu, Nazca, etc., are at significantly higher elevations than much of the pre-flood landscapes that were evidently being occupied by humans. What prompted mankind to construct such structures in these elevated locations? Lots to consider. The vast masses of diluvial gravel do not belong to one violent and transitory period. It was indeed a most unwarranted conclusion when we assumed the contemporaneity of all the superficial gravel on the earth. Although it is unfortunate that the book is so expensive (for 66 pages). I had no control over the price – it was set by the publisher who said it was a function of the color images and their necessary density (for clarity). Because it was so expensive, I asked that the Kindle price be much different, and it is. Fascinating – I’m in the process of researching the opposite – one of the many ‘floods’ ravaging the east coast of Africa around 12000 ya. I’m more inclined to say the Serpent in the Garden is both Satan & Sophia. Given that Sophia, like Demeter, and Ayahuasca, personifies the entheogens, I suspect the fall of the Antediluvian age was prompted by the Soma, as told in the Rig Vedas when Indra slays the son of Danu, Virtra. A response to your, Where did all the extra water come from for a global flood? I believe in the Biblical account of the Great Flood, but these verses I want to point out is this. Genesis 1:6 ¶And God said, let there be a firmament in the midst of the waters, and let it divide the waters from waters. Genesis 1:7 And God made the firmament, and divided the waters which were under the firmament from the waters which were above the firmament:and it was so. Firmament is an expanse i.e. Sky/Heavens. So, the sky separated the waters below from the waters above. The Scofield study Bible describes the waters above as a vapor. I believe it was a water layer that cover the earth like the glass that protects a Christmas globe with snow in it. Genesis 7:11 ¶ In the six hundredth year of Noah’s life, in the second month, the seventeen day of the month, the same day were all the fountains of the deep broken up and the windows of heaven were opened. I believe that to mean that water that was deep within the earth was made to come out of the earth, adding to what was there. More importantly, I believe the waters above the firmament were completely released and fell to earth, never to exist in that state again. Whether you believe in the age of these Biblical figures, I do believe this water/vapor that encased the earth acted as a filter for sun rays and prolonged man’s age. Once that water was no longer there, you can see a steady decline in the length of age of people in the Bible. That is my belief mixed in with theory of where all the water came from to account for a worldwide flood with enough water to submerge all land. As to when the Great Flood took place or Noah’s flood, I believe it happened before the Younger Dryas. That maybe out of line with a lot of Biblical scholars who seem to think that it took place some 5000-6000 yrs ago, but I think the dating is out of sync with what we find. I think the Younger Dryas took place after the Great Flood and the ice caps that formed over the Northern Hemisphere of Earth was water from the Great Flood at some point. That’s how ice was able to form miles high on the land mass. Again, these are just my ideas and I have no educational training to substantiate what I am saying. I am just using my belief in the Bible mixed in with my belief of Graham Hancock’s work, which I am also a huge supporter of. Thanks for the article and your book. I have been waiting for Phaeton to resurface, but I also believe (sans data, currently) that the ice caps which melted at this time, were formed from waters of Mars Ocean, which was thrown into space when the planet was placed with no small amount of force into it’s current miserable orbit, in it’s currently maligned shape. I would be interested in an aproximation of the volume of the lost Ocean of Mars and the ice sheets of the continents, pre Younger-Dryas . . . Just for the possibility (and curiosity). Thanks for plotting the additional impacts, good work. 1). Is there any physics//math capable of calculating the forces required to move Antactica and Australia to their current locations? 3). does the vector-force path relate these things as coming from one rather than the other comentary field in our solar system? . . . I ask because the last few impactors have come in very, very flat to the surface, and this woulfd correlate with the debris field which has Comet Enki in it. The carolina impacts are also very flat to the surface, making me wonder id Phaeton belonged to this comentary cloud as well. 4). Not overlooking the whopping huge crater under ANTARCTICA’S ice, under the ice sheet. Solid vector-force figures would go a long way in cementing the possible sudden movement of these parcels of land (Antarctica and Australia). And also to aproximating the impact velocity, or substantiating it, if it is presumed known. And I will have your book on the 1st, and post again, after reading it. I am a huge fan of Graham and love the ideas and books he has put forth in search of new truths! As far as this theory goes, I can’t help but wonder, as Dave pointed out, how does this account for the vast and ancient diversity of sea flora and fauna in today’s oceans which are millions of years old? Could that many different creatures of all shapes sizes and environments (e.g. extremophiles) have evolved and proliferated from bodies of water which, according to the new ancient map, look like ponds or puddles compared to today’s oceans, in just 13k years? It seems implausible to me. I would think the oceans would be much less diverse, resembling something more like swimming pools with a few leaves in them. The species we encounter are all survivors from the flood. Try to imagine the diversity of species lost in the event…. Just to get this straight it appears that you believe that there was once a tiny fraction of the water we currently see covering the globe, and that this water as we know it was introduced circa 12,000 years ago. If that was the case and water was contained in very isolated fragments, in depressions 2 miles deep, how do you account for the numbers of fossils of sea dwelling animals we find in and around current coatal areas, and indeed on current continental interiors? Current scientific thinking says life began and evolved in the seas, but it seems to me to be quite unlikely a scenario if the sea was, as it seems you are suggesting, basically a series of isolated puddles. Do you have a competing theory on how life originated on Earth too? The same geologists touting ‘no flood’ also would have us believe that the continents slowly moved from some original ‘Pangea’ location, right? That is, are we not supposed to believe that great land masses move about by internal fluids reaching up to the surface? Really? You can believe that if you want, and you can believe that turbidity flows carved the submerge drainage, too…. However, a very recent finding indicates that some geologists might soon put an end to drift and related fantasies/notions, and we will recognize that ‘drift’ theory constitutes geologists’ other major error. I hint at its ‘fix’ in my Afterword (if that’s inaccessible to you, then see if you can’t figure out what happened by pondering the northern and southern extents of South America). Thus: geology has another big error, and its correction will explain earth’s landmass configuration, its rotation, and its tilt, as well as your fossils. What the earth was like prior to that would be guessing, but whatever it was – that is where life began, and the two major events (landmass movements and the flood) have transformed our planet to what it is now. And we know none of it because of the incredible errors made by geologists in the past two centuries. So, as a first step: how about helping to make geologists recognize their more pervasive and scientifically damaging ‘no flood, ever’ error?